Rubbish: Rubbish is collected every Tuesday, even if Monday is a holiday. Stickers (available at Nichol's Supermarket) are to be placed on the garbage bag, NOT on the can. Recycling : Recyclables are collected every Wednesday. Place items to the curb after 4:00 p.m. the evening before pickup. Need a blue bin? Blue recycle bins are available at the Village Clerk's office or by calling the DPW department. E-Waste: The Village can no longer pick up electronic waste. Contact OCRRA for more information. Large Item Pickup: For a list of common items and their appropriate number of stickers Click HERE. Large items are picked up on regular trash day. They must have the appropriate stickers placed on them. Orange stickers - 30 lbs. and green stickers are for up to 15 lbs. To properly dispose of liquid latex paint, dry it out and place the can next to the trash can with the lid off. 2 - If there is a lot of paint, add cat litter or paint drying crystals (available at most hardware stores) to the paint. Leave the lid off and wait for the paint to be absorbed. Please note the DPW CAN NO LONGER pick up these items: Call OCRRA at 315-453-2866 for more information. Leaf Pickup - Is ongoing until the snow flies. There is no schedule. Please rake leaves to the curb (not in road). Leaves only, no yard waste please. Yard Waste - Will begin April 1. It is the 1st and 3rd Monday of each month. There is no street schedule. Click HERE for detailed information on processing yard waste. Yard waste includes grass, brush, leaves, seedlings, shrubbery, Christmas trees and trimmed tree branches. Yard waste DOES NOT include dirt, stone, lumber or debris resulting from private of professional tree removal. The yard waste policy is intended for the use of Village residents and excludes waste left by any professional service provider. It is not intended to include any waste from tree removal, whether the tree was removed by a professional tree service or the homeowner. Yard waste does not need to be tied, but must be placed in small, neat piles at curbside (not in street) according to the requirements listed below. NO PLASTIC BAGS PLEASE! Yard waste should be placed at the curbside any time after 4:00 p.m. on the day before the scheduled pickup day. 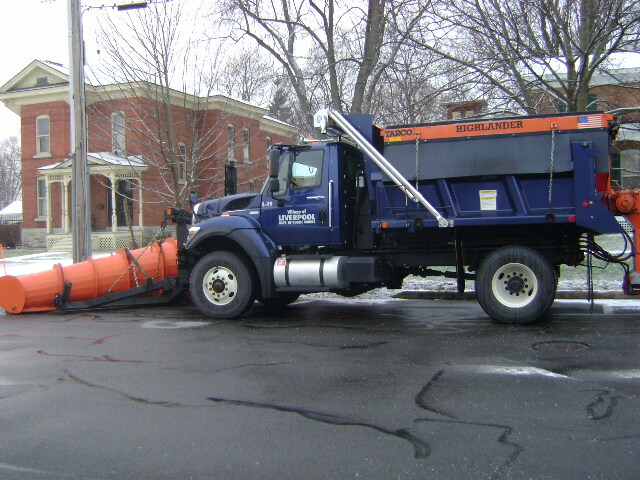 The Liverpool Village Department of Public Works Superintendent is a supervisory position with responsibility for overseeing the proper maintenance and repair of all village streets, sidewalks, trees, storm sewers, cemetery, parks, buildings, and grounds. The Superintendent will effectively supervise, contract, or perform any activity necessary in the field of public works for the Village of Liverpool. The DPW Superintendent is responsible for the development of and follow-through on department procedures for the following inter-departmental inter-agency protocols and for all department results. The Superintendent prioritizes department activities based on requests from Village residents, routine work, emergency situations and directives from the Village Board of Trustees. - Oversees the work of all contractors. Advises the Village Board on payment to contractors. -Enforces regulations and maintains accurate record keeping in compliance with all OSHA and DOT safety requirements for personnel operating motor vehicles, using heavy machinery and working with hazardous chemicals for the department.